The standard hopper holds an even 7 pounds. Using a 3/8 drillmotor at 500 RPM gives you a crush rate of 6 pounds a minute making the big grain bills fast and easy. 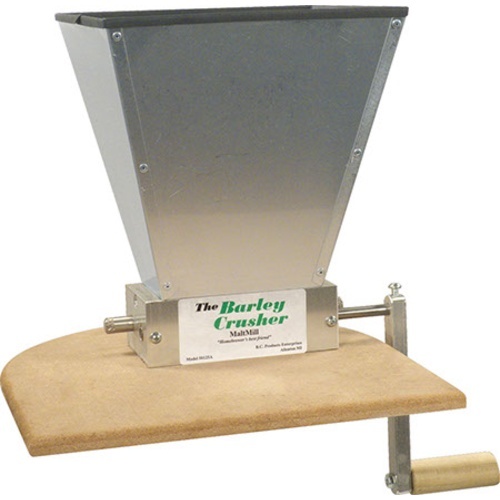 Simple, easy home brew grain crusher. Can be used as is or converted with an electric motor, though I would recomend slow and steady with the hand crank as the crush is better with manual power rather than a motor. Reviews reported solid construction and good functioning; not as pricey as others. I choose this unit because of hopper size, already adapted to a 5 gallon bucket, and the ability to operate with a drill motor. Hopper on cheaper mills problematic. Doing more all grain recipes. 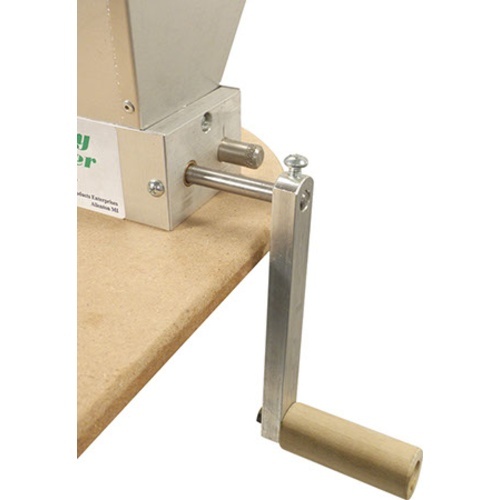 Want to mill grain fresh. Is this mill a 2 or 3 roller? BEST ANSWER: 2 roller. One roller free spins, the other is driven by the supplied handle, or you can connect a drill. Been working very well for me for a few years. It is a two roller mill. I have been using it for over a year with excellent results! 2 roller and works better than expected. I would buy it again! 2 roller. It works great though. 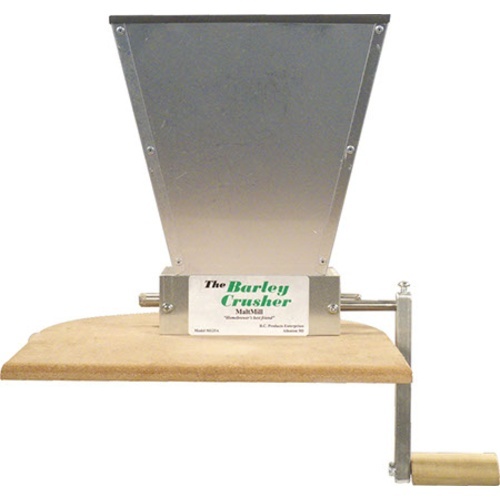 Had an expensive grain crusher “Captain Crysh” which didn’t work well at all. After years of frustration I bought this. It crushes grain great but you have to watch as it is very light and it’s easy to have the hopper dump grain both when you start the drill and when it is sitting there with the drill attached and you aren’t hanging on. When starting the drill hold onto the mill solid and it will be fine. A few accidents later I was very happy with the crush quality. I’ve only used it once though. Gets the job done! Adjustable gap is a plus. This is an OK mill. Gap was good out of the box, and I like the protective rubber around the hopper edge. The knurling is pretty rough, grips the grain well. I've only used it with the handle (having kids is handy...), haven't hooked a drill up yet. Kinda looks lame though, and feel like it's manufactured in a garage, I'm kinda used to a higher level of polish in products. The label looks ink-jet-printed onto adhesive labels and stuck on (mine was slightly off-angle), looks very unprofessional. No documentation, I had to find a picture on the web someone took of a third-generation photocopy that the company sent them. The price through MB wasn't great, either, other places sell it for less with free shipping. Just what a beggining AGer needs. The little crusher that can. Was using a old Corona, bought this and my efficiency went up over 10%. Easy to adjust grind. I use a variable speed drill to power it, much quicker than cranking. Must be a fairly strong drill. Used it once so far with both the handle and a drill and it worked well. The gap was easy to adjust. It gave us control over one more step of the process. Can't wait to use it again! Perfect grist Out of the box. Used it once so far but works very well and it’s hard to beat the price. Was recommended to me by somebody who brews a lot more than I do. This is my second unit because I dropped my first one a few times. So, a reminder. Remove your drill when walking away if the hopper is empty. Crushed a few different grains so far; from pilsen to carapils. It gave a great crush, worked right through the tough carapils. My only comment would be that the o ring lasted all of a few minutes. Fortunately, the o-ring is not necessary for the operation of the mill. Works great right out of the box! Make sure you hold board down. It’ll take off on you if you’re not paying attention and flip off the bucket. Totally my fault. Great product. 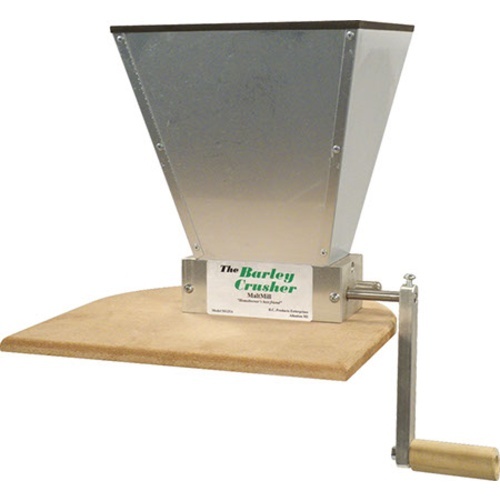 I got this grain mill as part of an upgrade to all grain brewing in a brew in a bag method. In my limited experience, it seems that the BIAB method benefits from a REALLY FINE grind - much finer than you get when I bought malt from MoreBeer pre-milled. My yield was very disappointing when I used the pre-milled malt, so much so that I had to add lbs of DME to hit my target OG. This mill can produce a grind that is somewhere between cornmeal and flour in fineness. This fine of a grind made a huge positive impact to my OG, getting a bit over the target OG without having to boil the wort at length. I find that attaching a handheld drill is the only way to go when the goal is a really find grind. It was a tough fight with the provided handle. Overall, I thought that the mill is a bit more flimsy than I had hoped for - I have the sense that the mill rollers are where the builder spent the money. If I keep at the BIAB method, I could see adding a heavier duty, upgraded mill to my equipment wish list. I love this mill. Works great. 've had this mill for several years now, it works but could be better. I've had it stop milling several times now in the middle of a grind. I've re-set the gap, air blown off the rollers, oiled them, with little improvement. Today, half way through my grind, it quit once again, cleaned it, brushed it, air blew it, with no avail. After nearly an hour of tinkering with it, I still couldn't get it to begin grinding again. I Had to go down to my LHBS and have them finish the grind. The price is right, but I guess in the end, you get what you pay for. Got this today, used it today, I am 100% happy with it today! No need to spend more in my opinion, have heard many complaints about the expensive grain mills. Cheers! I have used this for 5 brews now. I hand crank therefore it takes about 10 minutes for 10 lbs. What is nice with having a crusher, I can purchase grain on sale and grind it fresh before brewing. No need to purchase milled grain...always fresh milled when brewing. I have had this mill for about 3 years now. I have never had a problem with it. It works great for a great price. I've used this mill for about 20 brews, so far, and it works perfectly. Instead of the hand-crank (tiring for even 10lbs of grain!) on the 5gal bucket method, I mounted it to a small rolling table and connected the axle to a heavy-duty speed-adjustable drill. Effortless that way and doesn't go too fast. Nice mill for the price. My buddy has a $300.00 mill, I think this one works just as good once you hook it to a cordless drill. I think his is faster when you hand crank but not by much. My battery was dead a few weeks ago, so I just got out the crank and got a 5 gallon batch cranked out in under 10 mins, no problem.